Proper staffing, customer comfort, and operational effectiveness is important for creating strong service delivery. With proper staffing organizations can covered needed service and production aspects of running the business. All operations should have in mind the customer needs as they are going to be purchasing the products and services. This requires the ability to move customers efficiently and quickly throughout the organization without reducing the potential for future purchases. 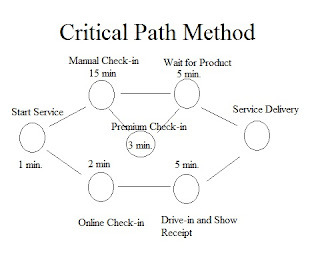 Likewise, the method of effectively improving slow spots in service and operations can be found using a critical path map or analysis. The sum of half hour increments times (number of operators required minus the number of operators assigned in a period). 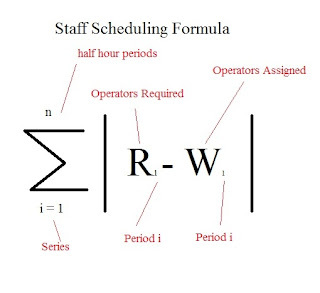 It is beneficial to see the staff scheduling formula below. 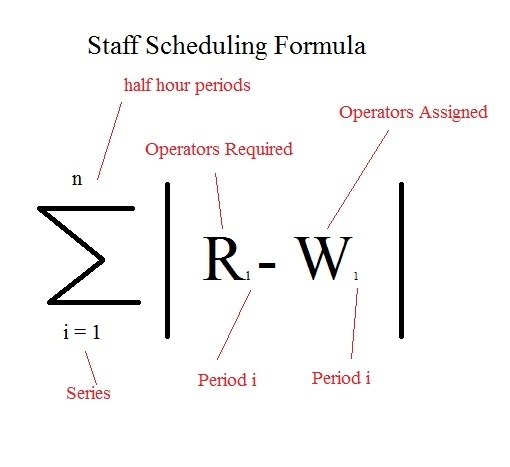 The purpose of such a formula is to reduce the amount of waste in schedules as often seen in organizations that suffer from higher labor costs. The more efficient a manager can project need and schedule accordingly the less cost to the product or service and more profit that can be made. However, one doesn’t need to get this complex to have strong staffing. Staffing is primarily concerned with effective coverage despite the methodology. The key is to balance the need for full-time and part-time employees in order to ensure that all of the needs of the organization are being met. Part-time workers come with advantages in terms of cost but are also limited in their knowledge and commitment to the organization. Therefore, full-time workers often make up a larger percentage of the employees due to their institutional and career knowledge. Automate: Simple problems and questions can be automated. Obfuscate: Reduce the perception of wait time. 1.) A list of all activities required to complete a project. 3.) The relationships between the activities. When outlined it is possible to use such methods to determine the amount of time, resources, and staffing needed for activities. It provides for a mental schematic for people who want to see how customers are moving and areas where there may be regular service delays. For example, if an analysis has shown that consistent service delays are occurring at a particular node it may be necessary to adjust, divert, or offer additional support to the path. Fitzsimmons, J. & Fitzsimmons, M. (2011). Service Management: Operations, Strategy, Information Technology (Seventh Edition). NY: McGraw-Hill.